Tree Care Pros provides Fort Worth clients both commercial and residential anthracnose treatment in Fort Worth, TX and surrounding Dallas Fort Worth regions. Anthracnose is a fungal disease in the genus Colletotrichum, a group of related common plant pathogens that are responsible for many diseases affecting a large number of shade trees in Fort Worth. Anthracnose disease spreads easily, and many popular tree varieties are quickly victimized by this fungal infection. These shade tree varieties include but are not limited to maple, elm, oak, dogwood, walnut, and a myriad of others. An arbor care professional is on the lookout for this frequently seen fungal disease that makes its appearance known in early spring when the weather is still cool and conditions are wet. Infected leaves exhibit many negative symptoms such as leaf deformities, dead and shriveled areas, spotting, blotches, and discoloration ranging in color from tans and browns to purple and black shades. Defoliation will occur and the tree will have a thinning appearance. Canker sores on bark and limbs, obvious wounds, and reduced new growth are indicative of anthracnose. A certified arborist should be contacted at the first sign of anthracnose. Although this tree disease rarely causes permanent damage or results in the tree’s death, its visual destruction is highly undesirable and unwelcome in neighborhoods. Anthracnose Treatment Fort Worth. The best Fort Worth arborist will conduct testing to confirm anthracnose presence and officially diagnose your ailing tree. Symptoms can vary depending upon the tree variety; therefore, only an experienced arbor care professional is qualified to conduct all testing procedures. Treatments must begin at the appropriate time depending upon the degree of the infection, so the tree disease expert will begin preparation for enacting the treatments. Fallen leaves should be raked and all dead branches must be removed and disposed of by a professional tree service. All tools must be disinfected to prevent further spread of the disease. Sprinkler systems that spray upward should never be used, and irrigation systems that water the roots directly while maintaining a generally dry environment surrounding the tree will be necessary during the preparation time period. The certified arborist will present you with the official diagnosis and the steps and treatments required to ensure the recovery of the tree’s health. 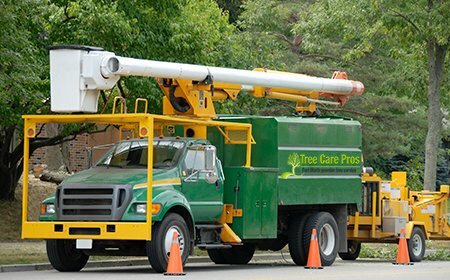 Call Tree Care Pros for Tree Services such as Tree Trimming, Tree Removal, Stump Grinding, Sick Trees Fort Worth, Tree Disease, Tree Doctors, or more. We’re a 5-Star Rated Tree Service in the Fort Worth, Texas area. If the tree is beyond recovery, severely infected trees should be removed and destroyed by a professional tree service who will take precautionary measures to prevent spreading the infection. Varieties with a stronger resistance to Anthracnose disease are available and the professional tree company will advise which varieties should be used if replacement is needed. For large, high-value trees fungicide application may be deemed necessary to restore the tree’s lush canopy and fullness, and timing of these treatments is critical. Complete high-powered spray coverage is necessary to ensure total protection. Fungicide treatments are used to protect trees before infection occurs, and a regular ongoing maintenance program is of high importance. A Fort Worth arbor care professional will provide a free consultation, accurately diagnose the diseased tree, and prepare and present a customized treatment and maintenance plan for your unique outdoor environment. Contact a certified arborist today and ensure that your stately shade trees remain in perfect health for many years! Updated on November 26, 2018 at 2:30 pm by Tree Care Pros.